I thought it would be fitting to wear a pair of A.N.D. boyfriend jeans to the Madison Men launch party that took place last week. The store now offers a well-edited selection of men's apparel that compliment its California chic vibe. It was a great night as the Pie "n" Burger food truck, Georgetown cupcakes, and Mr. Michael Chiklis all made appearances. A historically difficult style to wear, a great pair of boyfriend jeans are hard to come by as they should fit loosely around the legs while staying far far away from the androgynous sag in the hips and derriere areas. The perfect boyfriend jeans are like the perfect boyfriend. They need to have a intimate knowledge of your every crevice and hug/lift/perk you up when needed while giving you room to move and grow. My loose fitting RD Style pink blouse cements my "this is as tomboy as I'll ever get" look while my pink satin Hollywould pumps inject a bit of traditional femininity into the outfit. I love wearing pointy toe pumps with rolled up jeans as they add a layer of sophistication to a casual look. Wearing this outfit, I had a strong urge to go to Vegas and play craps and blow cronuts from my cigar. Ideally, Joe Pesci would be standing next to me but I'd make do with Michael Chiklis. 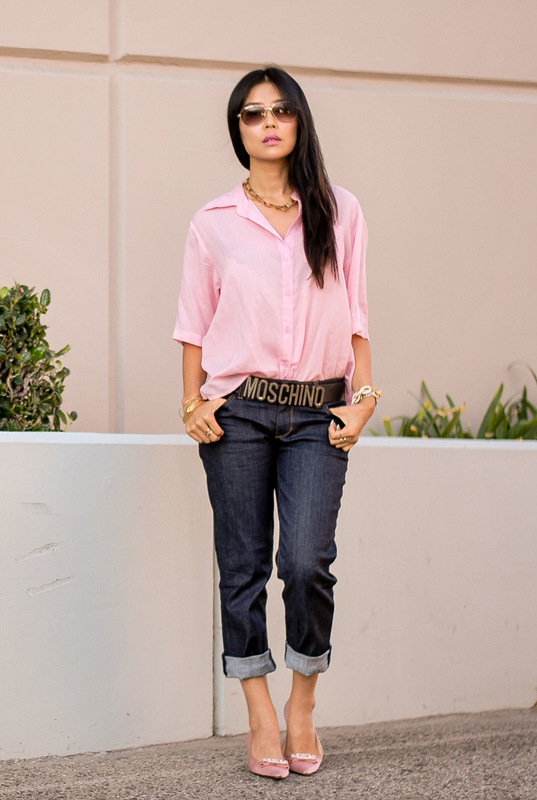 cute look, loving the pink tones on you with your accessories! I love your look, you take it with personality. I usually see boyfriend jeans in a lighter, distressed wash but this darker version is so chic. Love it! Now that's one sweet & fab look Attorney....you look so fash as usual!!!! I love this look! Perfect balance of feminism with the Boyfriend jeans! Please visit my blog for latest outfit. I am in love with the shirt, the colour is so pretty. This goes on my wish list. The belt is nice and loud. The pink top was definitely the best way to offset the boyfriend jeans! the best way to wear boyfriend jeans with any top it gives a great look..! !